July 13, 2015 – As NASA’s New Horizons spacecraft zooms past Pluto in a flyby that will culminate on July 14th, 2015, the Colorado-based handmade planetary science accessory brand, SpaceBling, is launching its Pluto flyby jewelry and New Horizons fashion accessory line. Susanna Speier launched the brand, MarsBling, in 2012 to tell the story of the Mars Curiosity rover as it drilled beneath the Martian surface, took selfies, analyzed soil samples and began traversing Mount Sharp in search of evidence that planet Mars was once able to sustain life. The JPL Store, The Lowell Observatory Starry Skies giftshop, TomboyX and The Museum of Flight have carried MarsBling. It has also been featured in Fast Company, on the European Geosciences Union website, Mashable, Live Science; Denver’s Paint the Runway and DenVhere fashion shows and at the Denver Mini Makers Faire and the Pikes Peak Art and Music Festival. 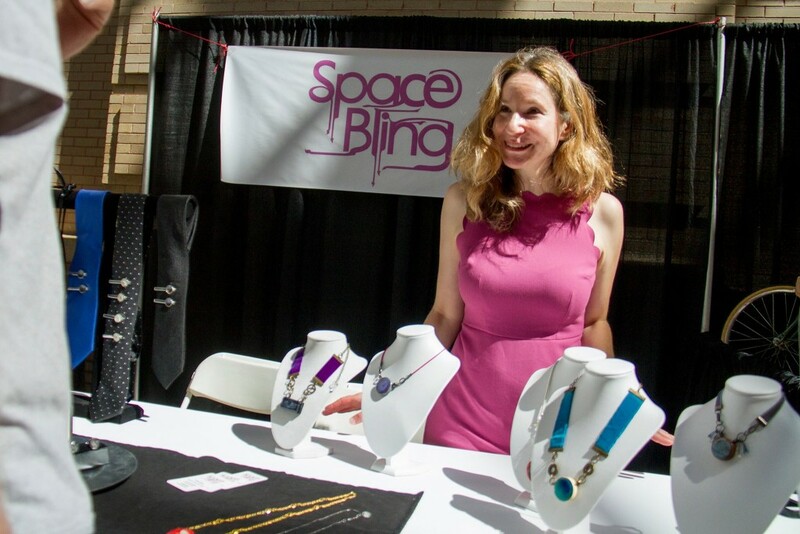 In early 2015 MarsBling rebranded as SpaceBling and began integrating space jewelry and planetary science fashion accessories built with Jupiter’s Europa moon and Saturn’s Titan moon. For the duration of 2015, however, Pluto will be SpaceBling’s primary focus. Speier is the coordinator of the Colorado Science Journalists group; a member of Art and Science Collaborations, Inc. and has bylines in Scientific American, Nature, Westword, Colorado Public Radio and The Denver Post.